This photo is from last summer - one of my favorites for the color and the great old country look. I confess it's not in Sharon, though - it's in our neighboring town of Millerton, on Mill Road. At last count 67 of the Daily Photo Blogs were participating in the Monthly Theme Day. Of course due to differences in time zones, some photos may not appear til later in the day, your time, or may be gone early (but you will find them in the previous day's post, of course.) So mail yourself around the world! Great shot! Quaint and simple and absolutely lovely. And is it by the "ole mill stream" as well? Lovely, lovely, lovely! ... and you are forgiven, mine is not from Auckland either..
Ah,the regulation US Mail box that gives rural routes their charm. Great shot. I love the colorful background with that peeling red paint job. Lovely background against the mailbox. You have really nice photos, jenny! Very romantic. Do you have the sort of mail boxes near you where you can put up a little flag and the postie will take your outgoing mail as well as bringing your ingoing? I loved that idea when I stayed in Wisconsin once. 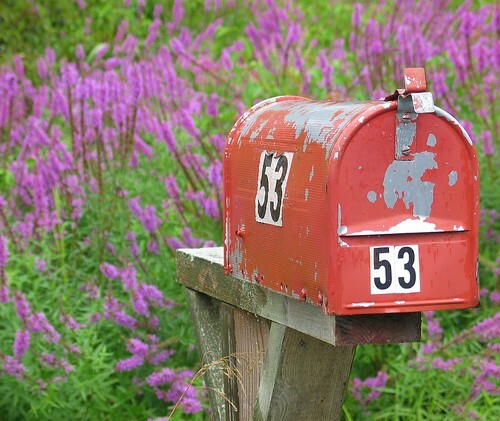 i love the colours, love the mailbox, love the background. This really screams "Americana" to me. What a beautiful photo and choice for theme day. Beautiful photo. Your photo inspires me to go on a photo hunt. In the suburbs here people often go to great lengths with the followers around their mail box ... I'm grabbing my camera and headed out the door. like the ones we watch on old american tv shows. Of those I've seen, I like this one best. It looks like it has seen heavy-duty service, and much loved by its customers. Don't see it as quaint at all, maybe eccentric by urban standards. But then, how often do you see such a beautiful bush beyond a postbox in the city??? This brings back nice memories of my youth---painting my grandma's mailbox in the summer (she lived in a very small Wisconsin town). Your photo evoked this long-dormant memory, and for that I say 'thank you'! Hi Jenny, Beautiful Pic indeed!